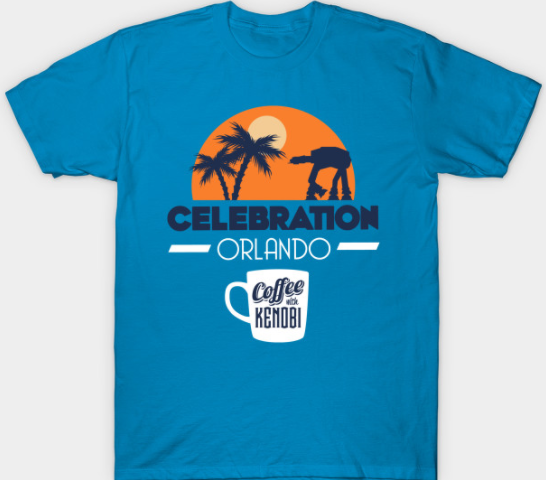 Celebration Orlando Coffee With Kenobi Tees & Hoodies Available Now! The Coffee With Kenobi Celebration Orlando tees and hoodies are available now! The exclusive logo features a beautiful image of an iconic Star Wars staple as it marches towards palm trees, on the way to sunny Orlando, Florida, and Star Wars Celebration. Whether you are attending Celebration Orlando in person or will be there virtually, you can show your CWK pride with this exciting new design from Coffee With Kenobi’s co-host and award-winning designer, Cory Clubb. Like all of the designs featured in our TeePublic store, you can choose from shirts, hoodies, phone cases, mugs, and much more, and in many different colors too. This is the Celebration tee and hoodie you’re looking for! Previous article Rebels Reactions: "Double Agent Droid"